Many crimes happen in Reading; vandalism, prostitution, voting majority remain, the endless crime wave will eat away at you like an auto-immune disease, until all that’s left is your spiteful skeleton clutching a stolen shotgun. You pace under the Oxford Road bridge, ready to dispense Punisher style vigilante justice, or so you might think. When you mention Reading to some people, they’ll relay the blight and terror of Britain’s own crime ridden Honduras, head to toe in muggers, dealers, and addicts, and as you sit on the bus to Reading, you stay pensive, regretting that you didn’t pack a riot shield and nightstick. Upon entering the outskirts, the fear becomes real. You see the dilapidated storefronts with couches dumped out on the pavements, and fruit stands selling apple flavoured mould and TB broccoli. As the bus clunks down the street, the run-down grey motif continues with the remnants of bankrupt businesses being left to decay. Then comes the infamous Oxford Road bridge. A local tells you, that the overpass is a prime spot for the exhausted nine-to-fiver, grabbing the warm embrace of a lady clam, before heading home for tea. But this overpass is rumoured to offer more than just the overnight love of a stranger at £120 a go. You’re told it’s the place to be if you wish to be relieved of those burdensome possessions we’ve all grown to hate, such as watches, wallets, phones and the ever irritating front teeth (making it risky even to take photos). Rest assured, a quick splash of style from your wardrobe to provide the dazzling prospect of loose change being in your pocket, and you’re set for a pricey Glasgow kiss, before being sent on your way. Then something happens, as you set foot in the city centre. 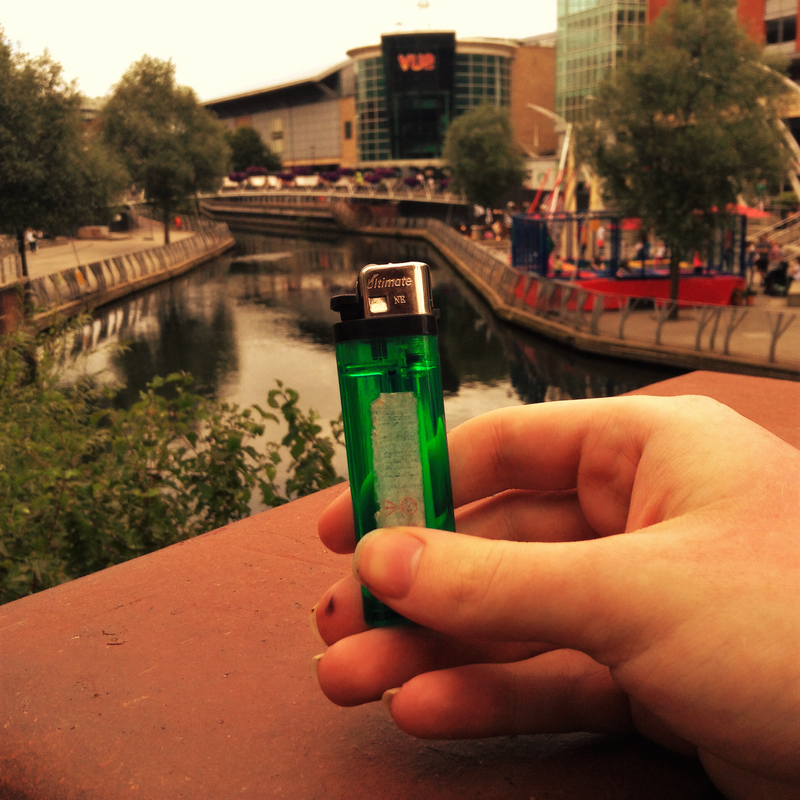 You see the squeaky-clean streets in which walk the charming, affable people of Reading. They go about their day educating themselves in bookshops, and developing their pallets in the abundant bistros and patisseries. As you peer over the river that runs through the town centre, you see the staggering delight of space-age Reading, and gleefully wander on, scouting the location in my lighter photo. With its chic buildings and futuristic cubic cut glass design, the heart of this town has an undeniable feeling that a bright future sits on its horizon. It is as you reach the doorstep of Reading’s pièce de résistance, you wave the little white flag of emotion in the face of resentment. The Oracle (modestly named) leaves the patchwork brick streets behind and stumbles into a world of white washed marble. You walk through and see more restaurants, along with a racy yet tasteful selection of lingerie. A return to civilisation, you eat chocolate, and buy a milkshake whilst sitting in quiet satisfaction: a gentrified remainiac.